Many thanks to the clients who have reached out by mail, email, text and Yelp to let me know they appreciate my work! “I began working with Kelly after a year-long sequence of serious illness, hospitalization and months of taking a very strong steroid with harsh side effects. I felt depleted and fairly depressed, but there was a carrot at the end of this stick: a return trip to India after a 50-year hiatus. In order to manage the trip well, I wanted to increase my stamina and flexibility and to lose the 15 pounds brought on by steroid use. Today, as I depart for this adventure, I can say that three months of twice-weekly Pilates workouts have helped me accomplish my goals. I feel much stronger and more energetic, and ready to take on a challenging trip. Kelly’s expertise has been vital to this physical and psychological improvement. Not only is she an accomplished and knowledgeable teacher, she is a very encouraging and positive ally. Although I fundamentally dislike exercise, I can honestly say that working out with her is a pleasure I plan to continue. Explains the “how” and “why"
"Kelly is a great teacher and really talked me through the "how" and "why" of each move. She also nicely corrects your form if you (like me) sometimes have no clue where your limbs are." Have you ever wished you could have a one hour massage after a stressful day at home or at work? 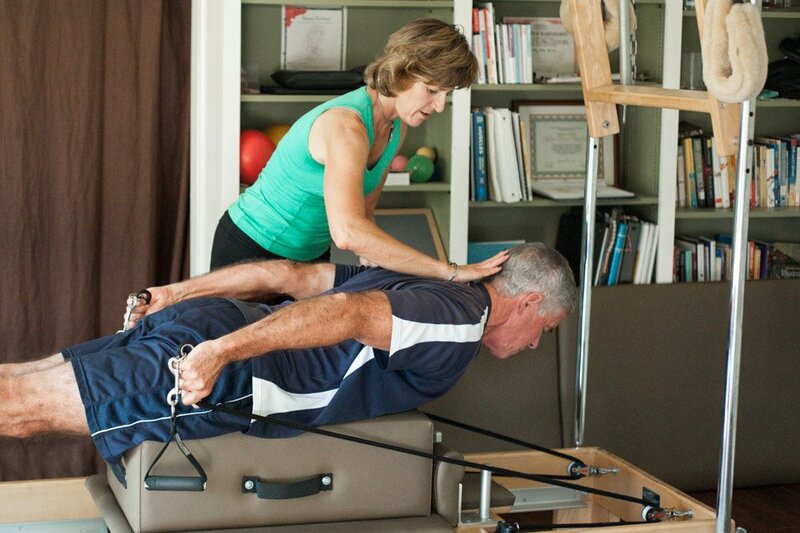 Here’s something even better: a one hour Pilates session with Kelly Etter! And the hour is enjoyable, even though she works you hard. Kelly’s Pilates studio is like a tree house. From each of the windows you glimpse either trees or branches. Just being in the studio is calming.